At the end of last year four rescue ducks arrived, 2 runner ducks and 2 call ducks. They have joined our merry flock of chickens, sort of, as they all seem to rub along together but the ducks live their lives in a different way. The ducks are quite ditsy and get in a flap about things, giving the impression they are total air heads and they walk everywhere in a line, in order of height, tallest leading. They are muckier and muddier than chickens and dredge up water so it doesn’t stay clean for long. But they are very cute and the first time one of them jumped into a bucket and bobbed around on the surface of the water, was a very sweet sight. They do have a little pond made out of a babies paddling pool in the shape of an apple. 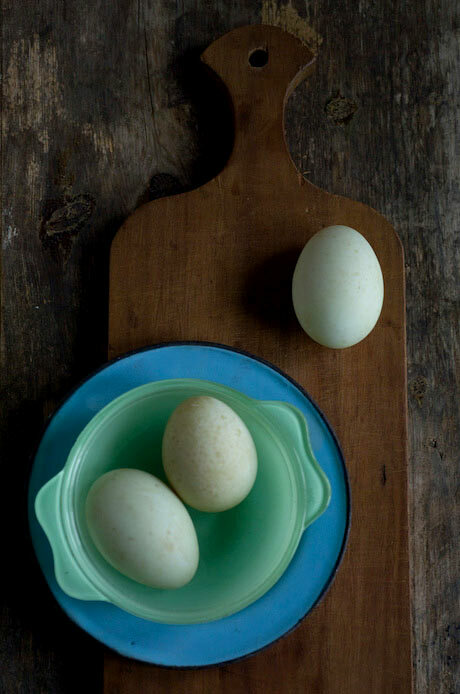 The other morning I found an egg on the floor of their house, our first duck egg, and there has been an egg waiting first thing, each day since. Its seems like a good reason to bake a cake to celebrate. My first thought was a prune sour cream coffee cake, which is a real favourite of mine. 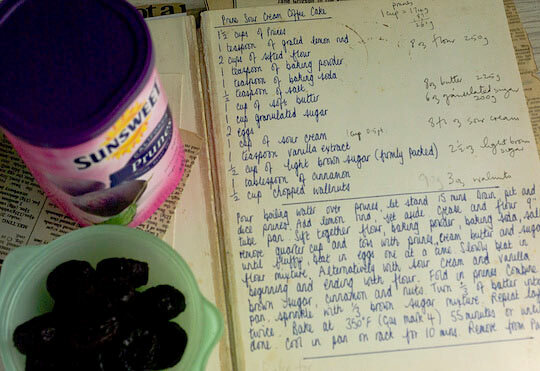 I came across the recipe printed on the side of a box of prunes, when learning to bake in the 70s. I copied the recipe by hand onto the end papers of my first cookery book, Traditional British Cooking for Pleasure by Gladys Mann, and every now and again get the book off the shelf and bake the cake again. To begin with, as a complete novice, I didn’t have a clue how to translate the ingredients, as it was an American recipe, written in cup measures and called for a tube pan. It took some years to work out what a tube pan is, what a cup of butter looks like and why a cake called a coffee cake has no coffee in it. I suppose I’m just more cosmopolitan these days. 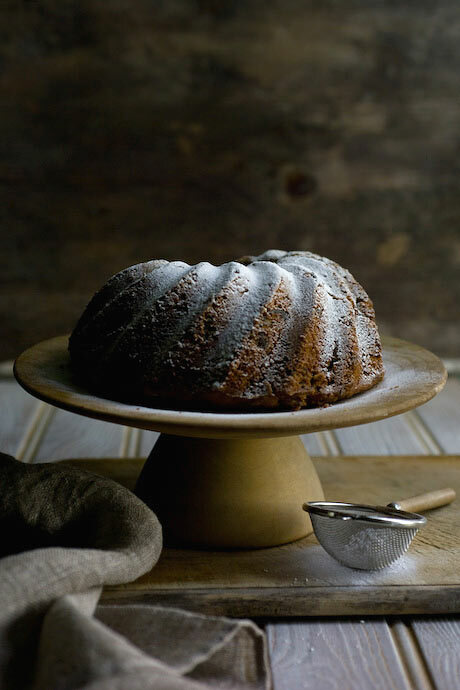 Consequently I’ve had many a disaster bumbling along and following the recipe but it still became a favourite as the flavour of the cake is so good. So here is the recipe with my conversion to metric. 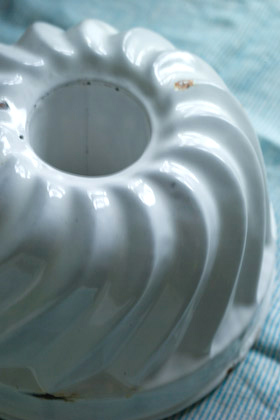 It is also a good reason to use a vintage enamel bundt tin that takes up far too much house space and needs to occasionally earn it’s keep. Grease a large bundt tin and pre heat the oven to 180C, 350F, Mk 4. Chop the prunes into smallish pieces and place in a bowl, add the walnuts, brown sugar, lemon rind and 2 tbsp of the flour and stir together to combine and coat the prunes. Sift together the remaining flour, baking powder, soda, salt and cinnamon. Cream the butter and sugar till light and fluffy then add the eggs one at a time. Slowly beat in the flour mixture, alternating with the sour cream and vanilla extract. Fold in the prunes. Turn the mixture into the bundt pan and bake for 55-65 minutes until a skewer when pushed into the centre comes out clean and the top feels set. Cool on a cake rack. Turn out and dust with icing sugar. Happy Easter from The Laundry and Laundryetc. This is supposed to be a quick one, but in true geek style has become something more. Inspired by Kerstin Rodger aka MsMarmiteLover trailblazer and proprietor of the first underground supper club in the UK, whose blog post at The English can Cook about her love of jars and forthcoming supper club event this Friday Jar Food – Pickles, Potions and Preserves , got me thinking about …. jars. Seemed like a quick blog post to gather some of my favourite jars together, without it becoming some big deal would be a possibility. Trouble is, that when the differences in ridges on glass are something you admire, you get sort of, caught up. Anyway, here are just a few from my collection and I hope you enjoy them as much as I do. Vintage French jam jars are such classics and feature plenty of ridges and facets in all sorts of variations. A good heavy handful and chunky lipped edge are what you want. A few nibbles around the top are OK too. You can always use them as candle holders and vases if you don’t have any confiture to fill them with. 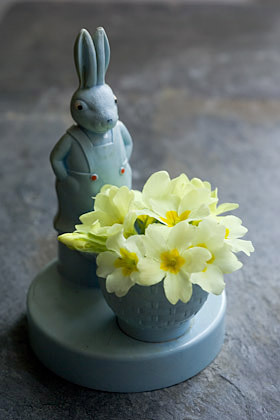 I will be selling some of my vintage French jam jars at the Selvedge Spring Fair on the 2nd April in London. Follow link for more info. When I wrote Fruits of The Earth my preserving book, (sorry currently out of print but will be available again in paperback in June) the publisher asked me to use some Ball jars, to suit the American market. They are virtually impossible to buy here in the UK but by one means or another, I’ve acquired a few along the way. 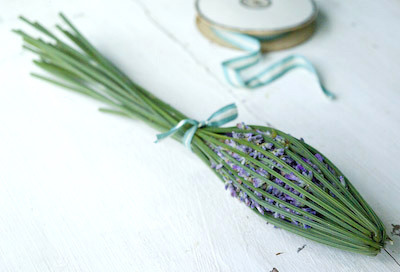 These vintage ones in beautiful turquoise glass look great when used as vases. I always look out for interesting shaped jars and my vintage English Wye Valley Preserves jars (I’ve got 2 of them) are real favourites. They just wouldn’t make them like that these days. Finding them was sheer fluke, so sorry no tips on where to look. Just keep your eyes peeled. Another Ball canning jar, this time with wire bale clip top. These aren’t recommended any more for canning but people do still use them. Finding new rubber seals is the problem. See the brilliant Food in Jars for more info about this. 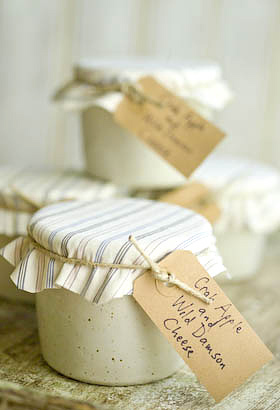 I love Ball quilted jelly jars and again you can’t buy them in the UK. My friend Chris brought me 2 back from the US a while ago and I use them repeatedly. They are so cute and worth looking out for if you are in the States. I’ve been given quite a few old Kilner jars by people. Often I’m given them because their owners think them now redundant but in fact you can still buy replacement seals for them. Peter Denyer at The Kilner Jar knows everything there is to know about Kilner jars, sells the seals and also reconditions the rusty tops. A real niche business. These Kilner Improved jars are great because they have a glass lid. For canning, there is something really satisfying about only natural materials, glass and natural rubber, being used here. Look out for old jars on your local Freecycle. Weck jars and flasks have such simple lines and are great for the modern pantry. Again, just glass and rubber used here and they work so reliably. I’m a big fan of canning cordials and syrups and find the 1/4 and 1/2 litre size flasks most useful. Weck jars are really easy to open as you simply pull the rubber tongue to release the seal. Also seals are reusable. 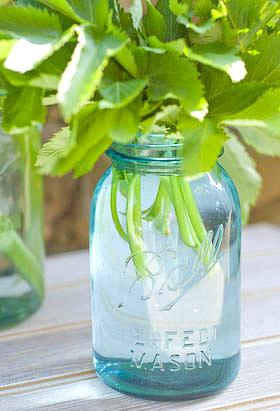 With great 70’s style, these vintage Ravenhead Kilner jars are another favourite that I use a lot. The screw bands were made in orange, red and brown plastic, and also white apparently, but I’ve never seen one of them. Again try The Kilner Jar for replacement seals. The last canned jar I tried to open was so well sealed that I had to email Peter Denyer for advice on how to prize off the lid. In true expert fashion, he told me to carefully slide a knife under the seal and gently lever. You have to be careful when doing this as chipped edges can totally ruin a canning jar and make it unusable. Kerstin’s Jar Food supper club is one NOT to be missed. Also her book Supper Club – Recipes and Notes from The Underground Restaurant is available to pre order on Amazon and will be published at the end of March. Just to let you know that I will be exhibiting at The Selvedge Spring Fair on Saturday the 2nd April 2011 at St Augustine’s Church Hall, Langdon Park Road, London N6 5QG. 10am – 5pm Entrance £2.50 I will be selling textiles from The Laundry, vintage French jam jars as well as some of my homemade preserves. My talented and creative friend Deborah Schneebeli-Morrell will also be bringing along some of her amazing papercut designs and we are working on some really special labels for labelling preserves which wont be like any others you have come across before. I will tell you more nearer the time, but in the meantime, do make a note of the date in your diary. See the Selvedge website following the link to see who else will be there. 2010 was the year I learnt about canning, or bottling, or hot water processing stuff in jars, whatever you want to call it. Following the year through ingredients, working with the seasons and the produce that was close to hand, has given me a real feeling of connection to the food that I eat and has changed my life and my approach to preserving. Not only that, I’ve got a cupboard full of food in jars, a sort of mini pantry, as my house is too small to include a special room or larder. Granted, most people don’t have shelves of bottled comestibles in their sitting room or lined up on the sideboard! See my friend Tigress’s recent post about her pantry ( the Domestic Goddess is sooo last century, now chatelaine in the buzz word!) and Dana and Joel’s great wall of preserves, in their city apartment. So you see it isn’t necessarily about having a special room in your house or living in the country. *From now on I am going to refer to the bottling and preservation of ingredients using a hot water bath process as ‘canning’. You’ve been told. I know that in the UK this causes some confusion as the assumption is that this infers putting food in tin cans, but I am talking about preserving food in glass jars. OK have we got that straight now? The biggest surprise for me has been how amazing the flavours of canned food can be. I grew up thinking that only fresh was best and that bottled, tinned and stored foods were second rate and down market. What I have learnt during my first canning year has totally blown that notion out of the water. Now the year has swung full circle and there is a feeling of beginning again, its time to take store and note the successes – the rhubarb ketchup, black grape chilli jam and lemon fig & lavender marmalade I want to always keep a stock of. But more importantly I want to plan my goals for the year ahead. Plant blueberry bushes on the allotment to produce enough fruit to preserve, thus bypassing those ridiculously expensive and tweeny-weeny cartons you get in the supermarket, and too plant an asparagus bed so that a few years hence I will be able to harvest my own crop. It is about pacing things, their needs to be a correlation between the amount of food stored and the rate it is consumed. There will always be some experimentation going on, but as well as enjoying the satisfaction of a well stocked cupboard I love the moment the spoon scrapes the bottom of the jar, each empty jar offering the opportunity to be filled anew. In the year ahead I will be using my preserved foods as ingredients for baking and to include as part of other delicious meals. As well as jams and chutneys, I’ve got cordials, compotes and fruit purees and pickles stacked on my shelves. Today for lunch I popped open a jar of salted caramel pear butter and another of squashed Blaisdon plums. A dollop of each plus some homemade yogurt (and a tiny sprinkling of hazelnut praline on the top just to be flash) made a really delicious snack. The important thing about these preserves is that they aren’t laden with sugar in the same way that jam usually is. This is why canning makes such sense. Sorry! This post was supposed to be about making homemade yogurt, but it has changed into something else. I’ll do the yogurt thing later as it seems a strange diversion to go there now and I’ve got other things I need to get on with. Anyone picking this up by Googling will be well annoyed. Month twelve, the very last Tigress’s can jam canning challenge and for December the ingredient chosen by the wonderous Tigress herself, who set the whole ball rolling in the first place, is dried fruits in all their jewelled and seasonal glory. Must admit, apart from chutneys, don’t think I’ve ever used dried fruits in my preserves so this is new for me. Yet again Fancy Pantry by Helen Witty, my all time favourite book, provided the inspiration. Her dried apricot & amaretto conserve sounded just perfect to meet the criteria of this months challenge, though I’m not a fan of adding alcohol to my jams. Well I say I’m not, that should be, I wasn’t. Over the last year I have discovered how a little splash of kirsch takes sour cherries from quite nice to amazing. Likewise a spoonful of calvados added to apple butter, or some Cointreau poured over squashed plums can take mundane to magnificent, adding something not necessarily consciously alcoholic but that somehow completes the balance of flavours in a wonderful way. This did mean I had to shell out for a bottle of Amaretto, the down side of acquiring a stock of liqueurs, they don’t come cheap. Thankfully, this jam turned out even better than expected, really special in fact, so now I’ve got plenty of the ingredients left to make more of the same to give as presents. I added fresh cranberries to my jam which are great not only for their flavour and seasonality but for the lovely colour they bring. 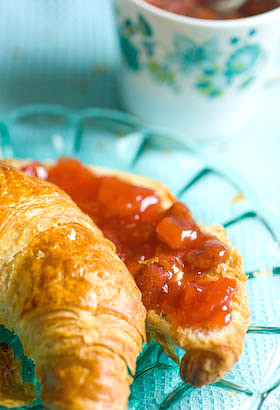 After I’d made the jam and started to think what it would go well with, ‘warm croissants’ absolutely shouted out to me. I have opted for bright orange sulphured apricots over the darker unsulphured variety for my jam because I can’t bear the thought of starting out with dark brown fruit. It doesn’t bode well in my mind, brown fruit can only get doomier as it cooks, and for a special holiday preserve you want to push the boat out a bit. This preserve could take even less sugar that I used. I did a sugar test on it using a refractrometer and found that it contained 57%. For a preserve to store well without canning, it should be nearer to 65%, so if you aren’t into canning and want to be sure this jam will store in the pantry for any length of time without worrying it will go mouldy, I’d advise you to up the sugar content from 450g to 600g, but taste wise it doesn’t benefit from it. The added alcohol will also help to act as a preservative. 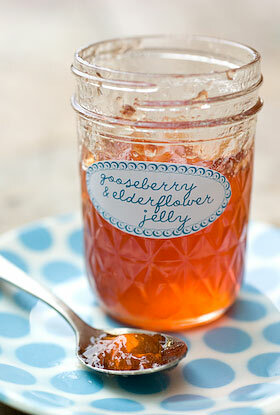 This jam tastes so good it most likely wont hang around long enough anyway. 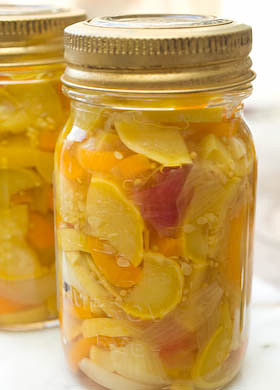 If you are not into canning, this should make it obvious why canning is so brilliant. 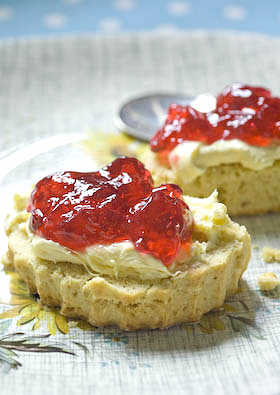 You can preserve using less sugar so the overriding flavour of your jam is the fruit it contains, not sugar. Preaching over, here’s the recipe. Chop the apricots into small evenly-shaped pieces. Place them in a bowl with the sultanas and pour over 0.75ltr (3 cups) water. Leave to soak overnight. Next day, prepare the water bath, jars and seals ready for canning. For more info about how to hot water process, refer to the guide here. 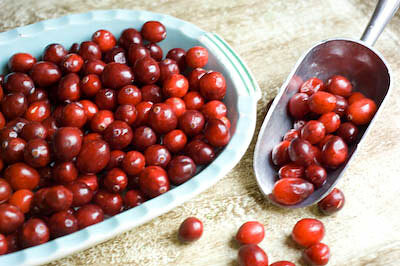 Place the cranberries in a pan with the remaining water and simmer gently for 15-20 minutes until the fruits have popped and are cooked through. 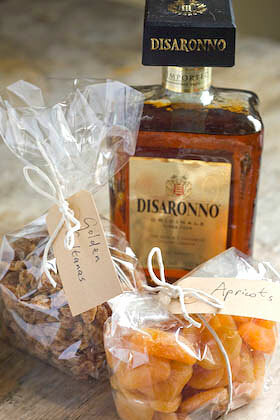 Leave to cool slightly, then add all of the remaining ingredients (including soaking liquid) except the Amaretto. Stir to dissolve the sugar and once it has, turn up the heat to a rolling boil and bring the jam to setting point (took me about 10-15 minutes), that is when a dollop on a cold plate readily forms a skin that wrinkles when you push your finger over the surface. Remove from the heat and leave to cool for a few minutes then stir in the Amaretto. Pour into hot sterilised jars, seal and process for 10 minutes. Remove from the water bath and leave till completely cold before testing the seals and labelling. Well that’s it. A whole year of the Tigresscanjam completed and wow, it has been amazing. I intend to write another post soon to round up what I’ve learnt and how it has changed my approach to preserving. Thanks to dearest Tigress for taking the time to not only oversee the challenge and the monthly roundups but for asking me to take part. To think that this experience could have passed me by …. well what can I say, how foolish I would have been without that gentle nudge. There’s still a way to go, but gradually I am conquering the mountain of fruits that inhabits my kitchen. Apples and grapes are still turning up by, what seems like, the shed load but the foraged fruits are becoming less plentiful and day by day more jars are filled and shelf space becomes more scarce. The pantry is now looking well stocked up for the winter and it makes the arduous jobs carried out along the way, fade to a distant memory. Like when I pitted cherries until three in the morning or spent over three hours shelling enough cob nuts to fill the tweeniest jar. Bramble scarred and nettle stung hands are at last healing after all the hedgerow foraging for rosehips and sloes. Why do they always grow surrounded by a duvet of nettles as well as having their own built in barbed protection for extra measure? There is still lots to do but at the same time it feels as if the big preserving season is starting to wind down. Everything made more recently has become more than one thing; canning apple juice produced a jelly bag full of apple pulp that in turn became apple butter; grapes juiced to make chilli jam likewise transformed into grape butter. Apple and damsons cooked and pureed earlier for cheese stretched to make an additional 3 pots of curd and the remainder, two sheets of fruit leather. The other day I had a fundamental thought – Note to self, remember to eat all this stuff! Sloe gin is maturing nicely and will be ready to drink by Christmas. Still with a colander full of sloes and a good amount of wild crab apples to use up it seems the ideal opportunity to rustle up a jelly and with a plentiful supply of vanilla pods, left over stock from my recently closed emporium, I decided to add them into the mix at the same time. I reckoned that to be an adequate combination of ingredients for my jelly until a handful of japonica fruits, eight small rock hard unyielding specimens, caught my eye, so they might as well join the party as well. 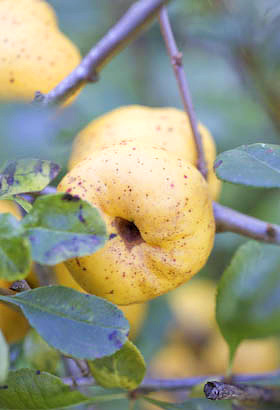 Japonica are the fruit of the ornamental garden shrub Chaenomeles Japonica and are similar to a quince. They are best used for making jelly and are sometimes referred to as jelly apples. I underestimated just what an impact these few fruits would have on this jelly. As soon as they started to cook in with the other ingredients, my house was filled with that fabulous perfumed quince scent. I added them as an afterthought but even with so few fruits they brought a lovely character along, in a ‘less is more’ way. I’m sure this jelly will taste fab without japonica as well, please feel encouraged to make things up as you go along with the ingredients you have to hand. 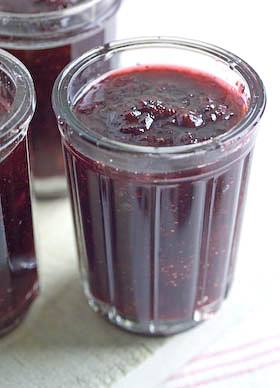 All three main ingredients are high in pectin, the stuff that helps jam to set, so are perfect for a jelly. 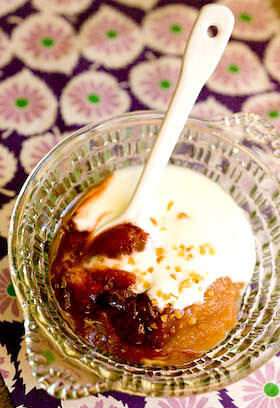 The end result has a beautiful colour flecked through with vanilla seeds and tastes heavenly. The quantities stated below are the amounts I had at my disposal and are given as a guide. My recommendation is to use approximately twice as many crab apples as sloes and calculate the amount of sugar based on the amount of juice this produces. Place the fruits in a large pan. Add enough water to barely cover and heat to a simmer. Cook for approximately 30 minutes, until the fruit is cooked through, mashing the fruit with the back of a wooden spoon and giving it a stir now and again. 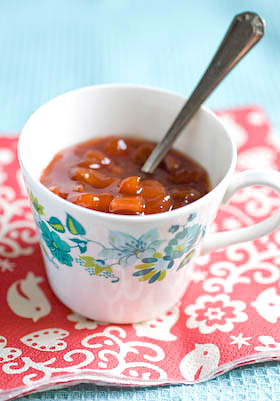 Remove from the heat and pour into a jelly bag suspended over a bowl to collect the juice. Leave overnight to drip through. Next day measure the juice and pour it into a jam pan. (Rather than waste the fruit pulp from the jelly bag, you can push it through a sieve or food mill to make a puree then use to make a fruit butter.) For every 600ml (2 1/2cups) juice, add 450g (1lb) sugar. Split the vanilla pod lengthways and scrape out the sticky seeds inside with the sharp point of a knife. Add the pod and the seeds to the pan. 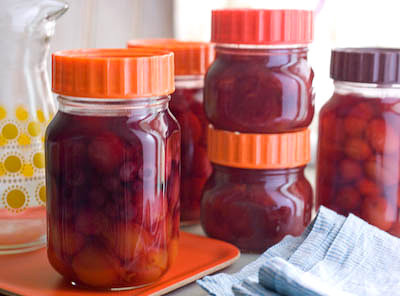 Place clean jam jars and lids in the oven to sterilise for 20 minutes at 100C (225F) or alternatively prepare a water bath and jars if you intend to can your jelly. Stir over a low heat to dissolve the sugar, then turn up the heat and bring to a rolling boil, maintaining until setting point is reached (this took me 20 minutes). To test for this, a blob of syrup on a cold plate will form a skin that wrinkles as you draw your finger across the surface. 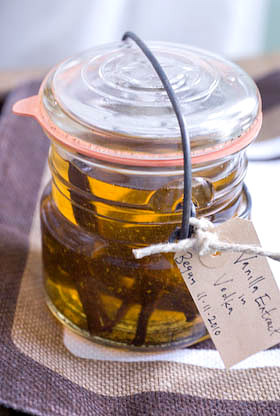 Remove the vanilla pod then pour into hot jars and seal. Alternatively hot water process for 10 minutes. Refer to previous posts and link for more canning information if you are new to this. Leave till completely cold and set then remember to label. 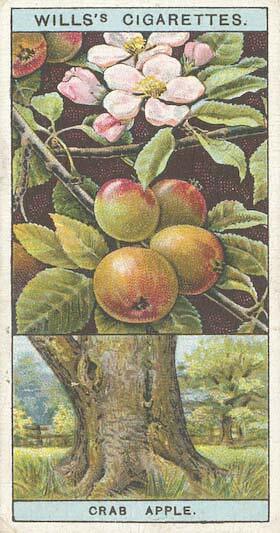 The crab apple and sloe images are from a set of 50 cards of flowering trees and shrubs produced and given away with Will’s cigarettes in 1924. Finally, a book recommendation: a recent find and now a favourite, Fruits of the Hedgerow and Unusual Garden Fruits by Charlotte Popescu (published 2005, Cavalier Paperbacks) is a really useful and charming book that I have spent many hours reading through for inspiration and it’s a snip on Amazon. On many afternoons recently, I’ve taken an hour or so out, to go for a walk foraging for ingredients. Some days this gives me a headache, as foraging can be a very intense activity and the level of ‘looking’ becomes a bit over the top. It is a brilliant way of discovering things though, when you look that hard you see things you would otherwise miss and find things you didn’t know where there. Foraging is not without its dangers however. I am forever getting my hair tangled in trees, ripping my legs through brambles and wacking my head on low branches when intently focused on something just out of arms reach. It is just too tantalising to go away from the path when you think there might be something to be found ‘off piste’. 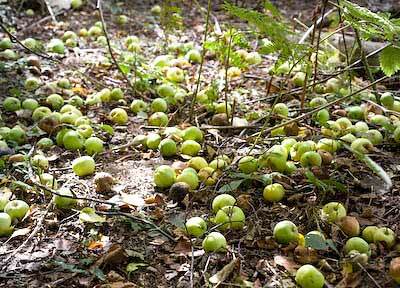 The other day I came across some windfall wild crab apples that required that I crouch down and crawl on all fours under low lying branches to gather them up to take home. Going forward wasn’t such a problem but backing out with my basket full and a camera round my neck wasn’t quite so easy. 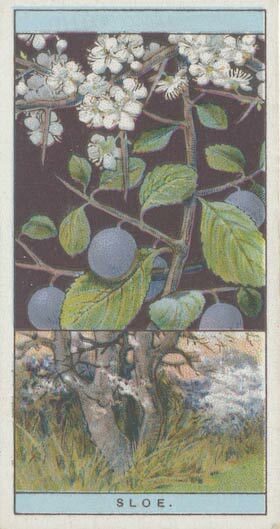 A couple of weeks earlier I’d been to harvest wild damsons, from a place in the forest I’d found the year before so I already had plenty of damsons at home waiting for the jam kettle. One by one, as you clock another crop, you are able to add them to your own personal ordinance survey map of fruits and berries. I love damsons anyway and the idea of mixing them with the crab apples, both wild fruits together, harvested on my doorstep, seemed a perfect pairing. 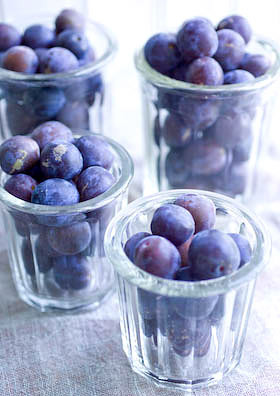 Damsons can be quite a pain to stone and wild damsons being smaller means there’s even more stones to contend with. Making a fruit cheese is the perfect solution, as both fruits can be cooked with very little in the way of preparation and then be forced through a food mill to leave just the fruit puree and dispense with peel and pips, cores and stones. Though it does require considerable patience I like using a food mill, but last year I found a vintage attachment for my Kenwood Chef on eBay that does the same thing, so now I’m all automated. 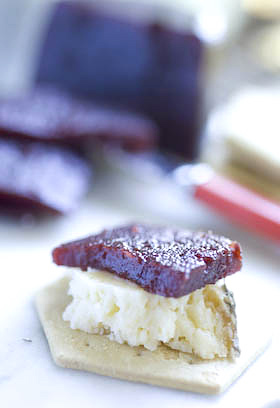 Membrillo, made from quince, is probably the most popular fruit cheese, served with the cheese board at the end of a meal, but damsons and crab apples have a particularly appealing Englishness about them. 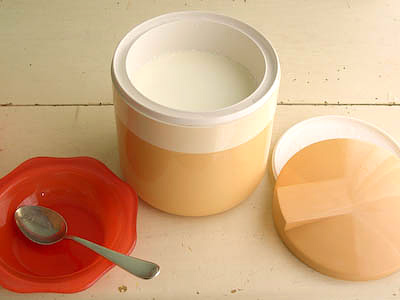 Fruit cheeses are cooked down until they are really thick and will set solid as they cool. This means they can be turned out and served in slices as opposed to dolloped from a spoon. 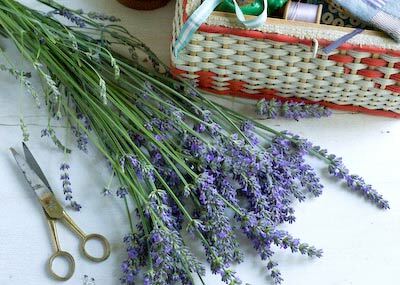 They need to be contained in jars or pots with slightly sloping sides that are wider at the top so they turn out easily. There are small glass jam jars around made for this purpose but I’m really lucky that Martin, in the pottery at Taurus Crafts made me some special hand-thrown stoneware jam pots, inspired by some vintage French ones I own. It is advised that in order to make it easy to turn out the cheese, you lightly oil the ‘moulds’ using ground nut oil or some glycerine if you just happen to have some handy. Rinse and drain the crab apples. Chop them roughly and place in a pan. Add enough water to just cover the fruit, bring to the boil and simmer gently for 20-30 minutes, till cooked through. Remove from the heat, leave to cool then push through a fine seive or food mill over a bowl to remove the skins, cores and pips and leave a smooth puree. 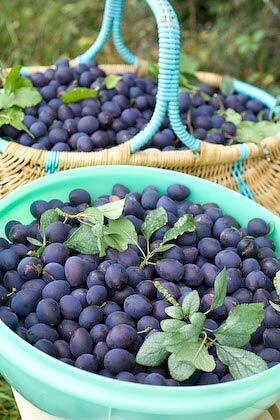 Rinse and drain the damsons, place in a pan and add just enough water to barely cover the fruit. Bring to the boil and simmer for 30 minutes, till cooked through and the fruit has burst. Remove from the heat, leave to cool, then push through a sieve or process with a food mill to remove the skins and stones and leave a smooth damson puree. I combined 800g (1.75lbs) damson puree with 400g (14oz) apple puree, so two thirds damsons to one third apple, but you can change the ratio to suit yourself and the quantities you have available. To every 600g (1.3lbs) fruit add 450g (1lb) sugar. Place the fruit and sugar in a pan and stir over a low heat until the sugar is completely dissolved. Turn up the heat and bring to the boil then simmer, stirring from time to time to be sure it doesn’t catch and burn on the bottom of the pan. Continue to cook until the mixture thickens considerably and when you pull the spoon across the centre it draws a line. This may take and hour or even longer to achieve and it is best to be patient and keep the heat really low under the pan. Pour the mixture into hot sterilised jars that are lightly oiled, cover with greaseproof waxed circles and seal. Leave till set and cold. This is such a great time of year to go out foraging. I’m getting so used to collecting my ingredients for free, I can hardly imagine buying any from now on. As well as berries and fruits gathered from the hedgerows when out walking, the house is full of an abundance of other free stuff people have given me that requires attention; apples, pears, grapes, green tomatoes, cucumbers, quinces, all set to become jams, pickles, jellies and fruit butters. It is sometimes quite a facing to deal with it all but the opportunity to stock the pantry is just to good to pass up, so I feel compelled to endeavour to work my way through all these luscious ingredients before they disappear for another year. It is amazing how much produce is out there going begging and often people with a plentiful supply of fruit have neither the time or inclination to do anything with it so are all too happy to give it away to someone who will make use of it. The more you let it be known that you are there to take these ingredients off others hands, the more stuff seems to turn up. Hence my kitchen smells of apples and quinces and I don’t have an empty basket or colander in the place. 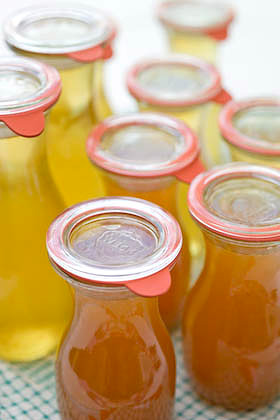 Cordials and syrups are perfect comestibles to make yourself and this is when canning makes such sense. 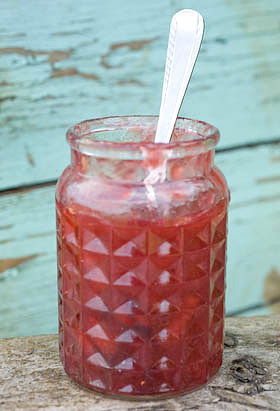 Whilst jams and pickles often have enough acidity, sugar and cooking time to ensure they’ve a good chance of staying safe enough to eat for months on end without water processing them (at least by European standards anyway), cordials must be either frozen or canned to help them keep for longer than a few weeks in the fridge. Smart delis and farm shops sell all sorts of cordials but they are really easy to make yourself. It is the pasturisation part that is the big mystery for most people. 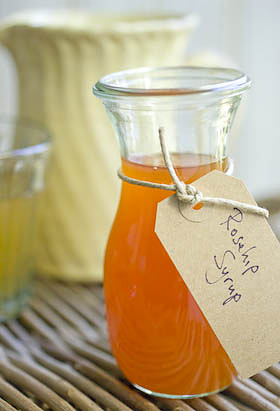 Rosehip syrup is an old traditional recipe, known for being high in vitamin C, so therefore particularly good for you. It does of course contain sugar and is cooked for a while which must surely reduce the amount of vitamin C, but hey, it tastes really good. 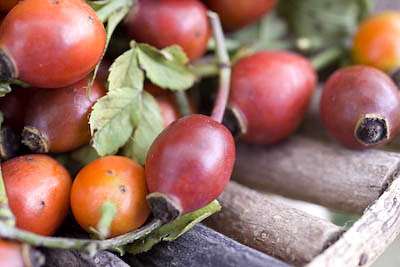 According to Wild Food by Roger Phillips, rose hips contain four times as much vitamin C as blackcurrant juice and twenty times as much as oranges, so even with a reduction from processing they appear to be stuffed full of goodness. It isn’t always so easy to find a plentiful supply of rosehips all in one go, in which case gather them whenever you see them and keep them in a container in the freezer until you have accrued enough. It is said that rosehips are best after a frost anyway but I find they’ve usually gone over by then so best not take the chance and miss them altogether. Making them into cordial thankfully helps avoid the fiddly and arduous job of removing the seeds from each hip, one by one, as they all come out in the jelly bag. The seeds are what impish schoolboys once used as itching powder in the good old days. I wouldn’t want them down the back of my liberty bodice. 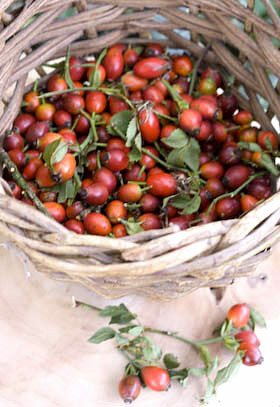 Wash and drain the rosehips and remove stems and stalks with scissors. Blitz them in a food processor, or put through a mincer, to help smash them up. Put half the water in a pan and bring to the boil, then add the rosehips bring back to the boil and remove from the heat. Leave to macerate for 20 minutes. Pour into a jelly bag suspended over a bowl to collect the drips and leave for an hour or so. Boil the remaining water and add the pulp from the jelly bag, bringing back to the boil and removing from the heat exactly as before. Leave to macerate for 20 minutes then pour into the jelly bag, collecting the liquid that drains through and adding it to the first amount collected. 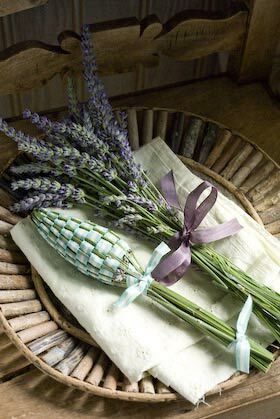 Prepare the water bath, jars and seals or bottles ready for canning. For more info about how to hot water process, refer to the guide here. Pour the combined juice into a pan and boil it until reduced to approximately 900ml (1 1/2 pints). Add the sugar and stir over a low heat until dissolved. Turn up the heat and boil for 5 minutes. Pour into sterilised bottles, seal and process for 5 minutes. Leave till cold before testing the seals, label and store.